2014 Corvette Stingray and BrainAvatar®™ 4.0 - BrainMaster Technologies Inc.
General Motors has always been a leader in innovation, and no machine or symbol is more iconic than the Corvette Stingray. So when GM decided to create a revolutionary “reverse test drive,” there was only one choice for state-of-the-art live brain monitoring technology to show drivers’ mental states and reactions to the unique experience of driving a Stingray on a profession track. A team of over 100 professionals converged on the Spring Mountain track in Western Nevada, to record and chronicle this first-time reverse test drive, in which the drivers do not test the cars, but the cars test the drivers. Six drivers were put into the latest prototype of the 2014 Corvette, and monitored with biometric and brainwave data, while they put the cars through their paces, or rather, the cars put the drivers through their paces. The enormous effort, which was masterminded by General Motors’ executive team, took the collaboration of advertising agencies McCann in New York and Commonwealth in Detroit, plus B-Reel productions of California, and a host of specialists in photography, lighting, guidance systems, and remote control, not to mention driving and track management. A fleet of over 100 prototype 2014 Corvette Stingrays was on hand for this project, managed by a team of expert mechanics and engineers. This project required the best of the best, and nothing less was acceptable. The drivers, who came from a wide range of backgrounds, were first trained in how to drive the innovative vehicle, and how to approach serious track driving. After the initial training, they were fitted with biometric monitoring devices and a full clinical-grade EEG cap, to prepare for the “real” experience. Drs. Ken and Landon Steele of Axion Mobile Imaging conducted the physical examinations and supervised the biometric monitoring. Dr. Thomas Collura,. along with Terri Mrklas and Bill Mrklas, of BrainMaster Technologies, Inc ., attended to the needs of the whole-head EEG recording and monitoring, which provided an essential key to the experience. Given that this was a first-ever test experience, no one knew what to expect. Without exception, each driver exhibited his or her unique physiological and brainwave profile before, during, and after the driving experience. It was possible to confirm, using objective scientific data, that, as GM claims, “Car and driver become one.” The individual results showed unique profiles such as the following: A professional “precision” driver (Craig) whose EEG showed that he remained an a relaxed and focused state, while leaving the work to those parts of the brain that serve vision, and motor control. 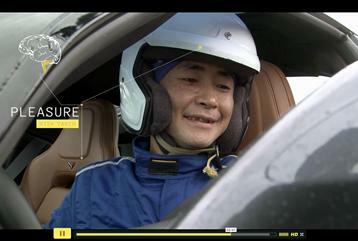 The driver was able to drive precisely and automatically, without a mental burden. A design and style blogger (Evan), whose brainwave showed him continually “scanning” and interpreting his environment, in response to the unique circumstances and experiences. As he drove, he settled into a state of experiencing confidence and a sense of control. A female fitness blogger (Kelly) who showed signs that her brain was processing a lot of information, and maintaining extreme alertness and awareness. As she drove, she became more comfortable, and became one with the experience. At the end of the drive, her brain showed that she felt safe, and wanted to continue. Brainwaves that are associated with the desire to remain still were notably absent. An entrepreneur (Philip) who was inexperienced, his first time on the track, and went out excited and aggressive. He had a couple of close calls, but over time, became more comfortable and was able to push himself even more. A design and style blogger (Terry) who approached the experience with caution and an eye for detail. As he drove, his anxiousness settled down as he experienced confidence and a union with the machine, that showed clearly in how his body and brain were performing. A software genius and semi-professional “endurance” driver (Kaz) whose EEG also showed a relaxed, contained state, and relatively little “high-level” processing or thinking. This explains how he is able to drive for hours, without fatigue. When the last day was over, everyone knew they had participated in something that had never been done. Science, journalism, and automotive innovation came together for the first time, showing that a car is more than a car, and a driver is more than a driver. When the two are put together, what happens is more than just a driver driving a car. The driver and car became one, and there was no doubt that it had been proven.